You know sometimes when you wake up in the morning and you want a brownie? This is how you can have one! Huzzah! 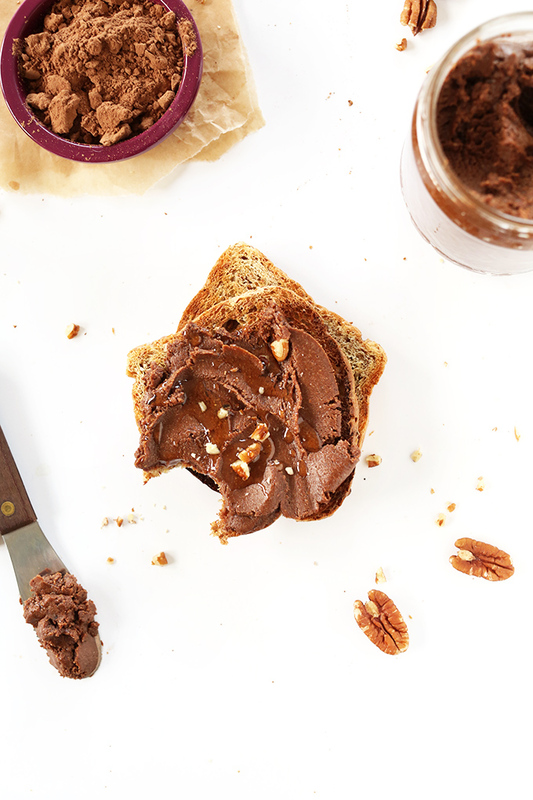 I make nut butter all the time, usually roasted almond with flax – it’s my go-to everyday spread. But last year I up and made Almond Joy Butter and it kind of blew my mind. 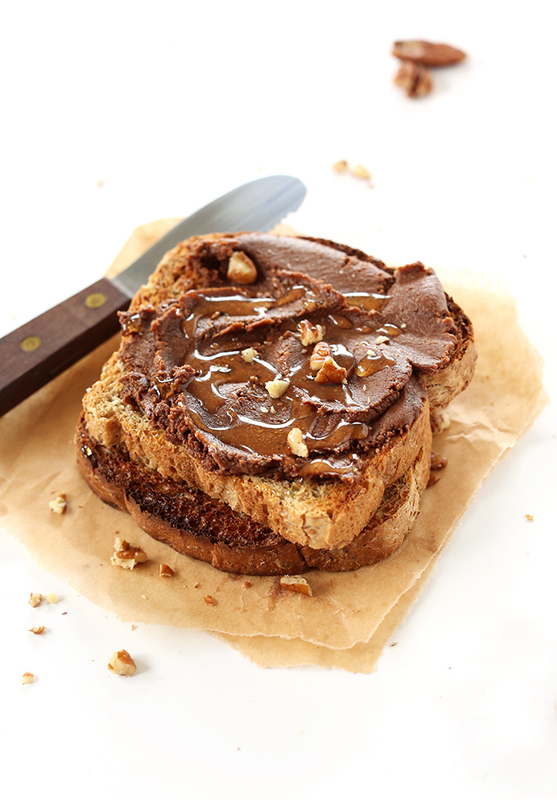 Candy bar on toast? Yes, please. 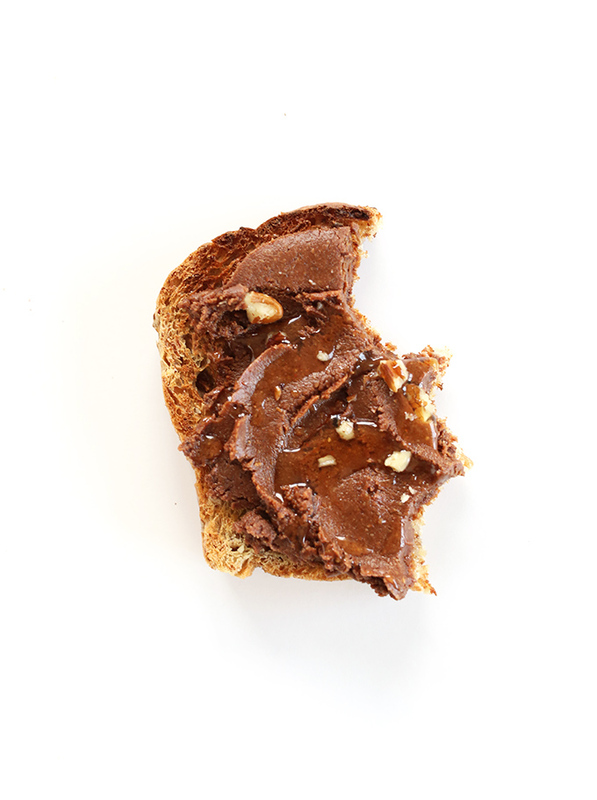 Minor ingredient adjustments can have a huge flavor payoff in spreads. Proof? 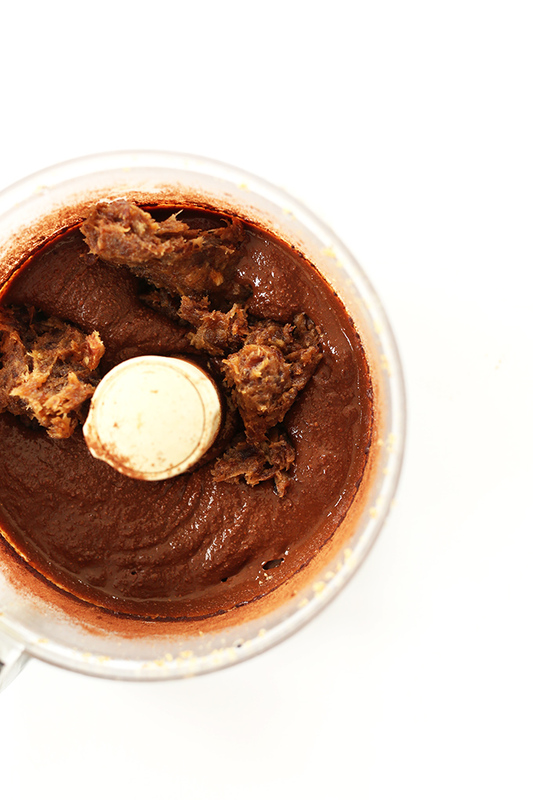 This fool-proof brownie batter spread that tastes just like a fudgy brownie. For the win. This spread requires just 6 ingredients you likely already have on hand! And it comes together in 30 minutes entirely in the food processor. Less mess, less time, less grocery shopping. That’s our motto. Dream your little heart out. 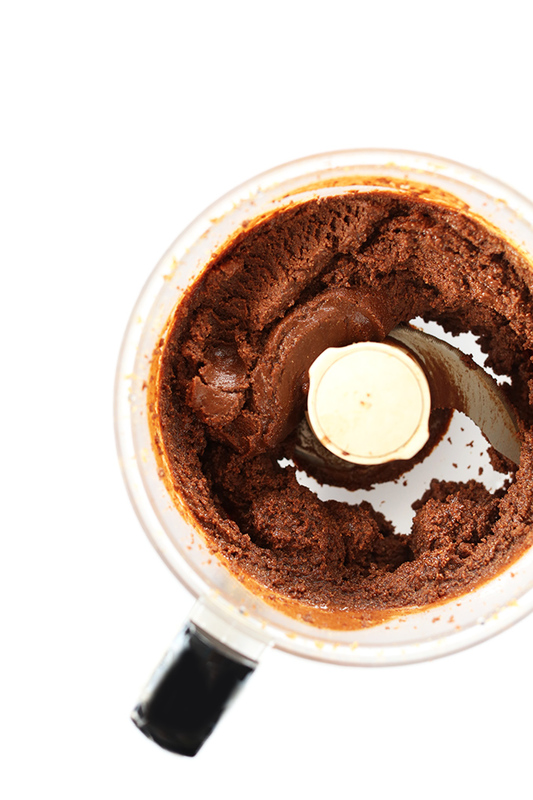 This brownie batter magic in a jar goes on everything. If you make this recipe, take a picture and tag it #minimalistbaker on Instagram! I love seeing when you make our recipes. Also, share it on Pinterest! It’s my personal favorite place for saving/sharing recipes. Thanks for following and supporting what we do. We kinda love you guys. Cheers! 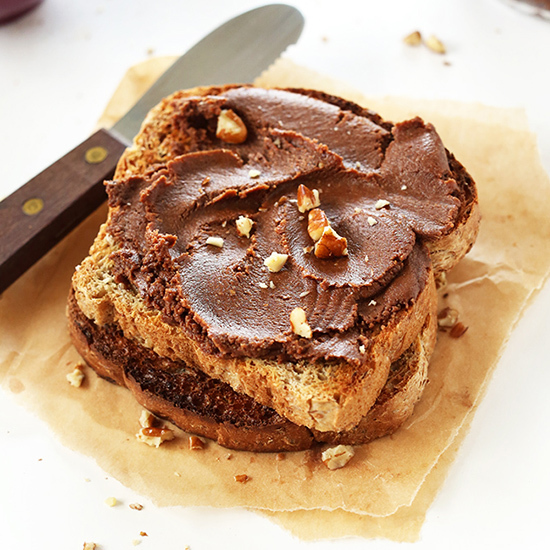 6-ingredient nut butter spread that tastes just like a fudgy brownie! Simple, vegan, gluten free and so delicious. Spread nuts evenly on a baking sheet. Bake for 10-15 minutes or until slightly golden brown and beginning to crack. Set aside to cool. While the nuts are baking, add dates to a food processor and blend until a paste or ball forms. Scrape out and set aside. Add slightly cooled nuts to food processor and mix until a butter forms, scraping down sides as needed. Add chocolate chips and put the lid back for 1 minute to melt, then blend thoroughly. Add salt, cocoa or cacao powder and mix once more. Lastly, add in date paste a little at a time until it reaches a spreadable thick batter. (Save any remaining date paste for other nut butters, to sweeten smoothies or oatmeal, etc.) Blend thoroughly, then transfer to a jar. If you refrigerate, it will get hard, so I recommend leaving it at room temp (kind of like you would nutella). 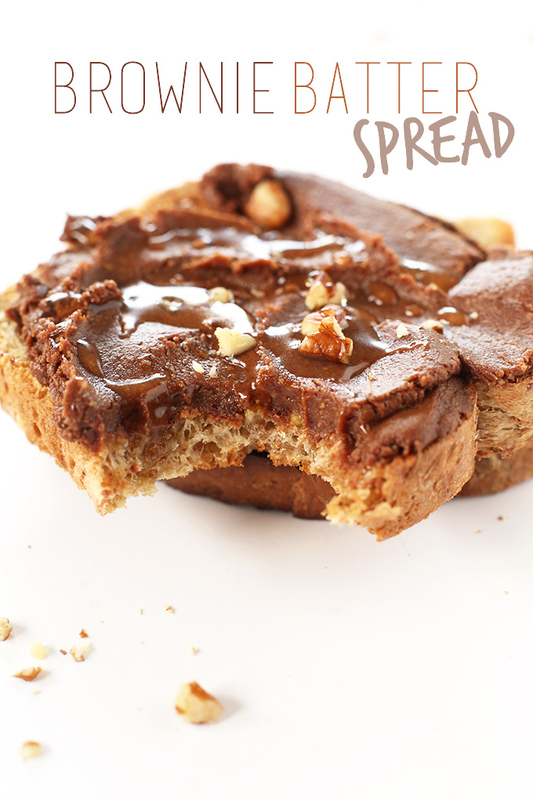 Spread on toast, fresh toast (vegan, banana, coconut cream pie), pancakes, or oatmeal, or add to smoothies and shakes! Can a bullet be used to make the spreads? Hi Barbara! It might be a bit more difficult, and require patience but it could work! Love all your recipes and dying to try all your granola bar-esque recipes, what food processor do you recommend/use? Thanks and thank you for all the tasty recipes! Also, could I substitute with store bought almond butter? Hi AManda! Keep going past that “powdery” stage, you’re almost to the butter stage. Just keep scraping down the sides. Adding water will definitely not benefit this recipe – it seizes up the nuts! Better luck next time! HOLY MOLY this is amazing! I am enjoying it on hot whole wheat toast with an ice cold glass of almond milk. What a treat! The hubby LOVES it. So I put everything in my food processor without reading the recipe first (stupid) and now it’s been blending for a very long time, but it doesn’t seem to become batter-like at all. I now realise this is because I put the dates in at the same time, but do you think it will ever become a batter at all, or should I just stop blending it and make them into brownie bites or something instead? Nice! Glad you enjoyed it, Yuliya! This looks soo delicious! Do you think it will work with a blender instead of a frood processor? Sadly I don’t own one, but a brandnew Kitchen Aid Blender which is waiting for its testing! Yes! It should work, but it will take a little more patience. Good luck! do you think it would work without walnuts- just doubling the almonds? I think so, but it will take a little more blending since almonds are sturdier than walnuts. Let me know how it goes! This recipe is just perfect!!! Thank you so much, your are such a big inspiration! 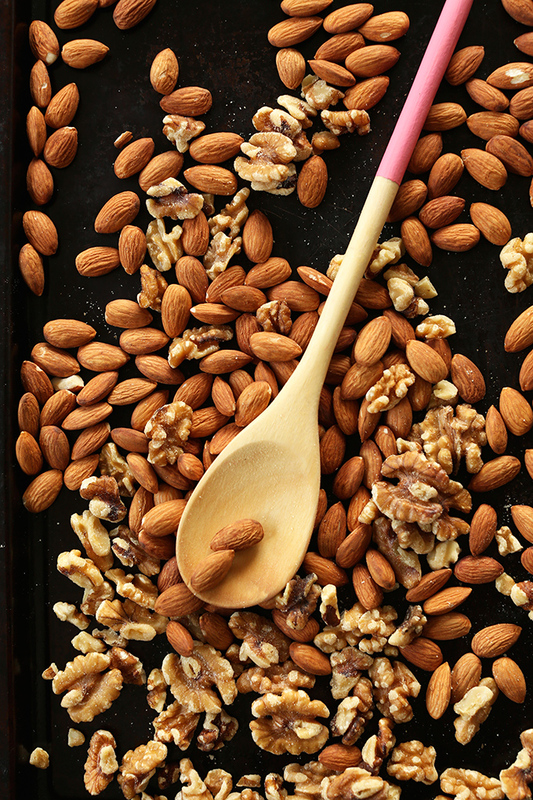 what would you recommend for substituting the almonds? Can any nut do? Yes! I think walnuts and pecans would work especially well. Could I sub in pecans for the walnuts and do 1.5 cups pecans and 1 cup walnuts? Pinned a few yummy recipes of yours, finally getting to look at ingredients. Our daughter is supposed to avoid gluten, cows milk, peanuts only :) and a few other random foods. So finding you has been amazing. I love to bake and it’s expensive to buy GF pre packaged foods. I like to know what we are eating. So finding your flour mixture has been great. Do you have a soft tortilla recipe? Being she’s a teen that’s a must! Hi Chris! I don’t have a soft tortilla recipe yet that’s gluten free. I know some other bloggers have amazing homemade corn tortilla recipes. As well, I’m pretty sure Udi’s makes a GF “flour” tortilla that I’ve tried and really liked! My mind is going in a million directions with this butter! Whoa! This is definitely happening in my kitchen. Win! This looks so mouth watering! I was expecting it to be a lot more calories than it actually is too – sounds far more filling than some other snacks. Andddd I definitely shouldn’t have read this post. Right before bed. Huge cravings! Looks great! This looks great! I’ll have to try it soon. Quick question: what food processor do you use? Looks delicious, love this idea!!! You just commented on my site. I think I just peed a little. Thanks, Gaby! Oh man!!!!! This is soooo dangerous….. Can’t wait to try the recipe. You only live once right? Makes my day when you post a new recipe! “Less mess, less time, less grocery shopping. That’s our motto.” Perfect for the busy life that we all seem to lead, so I’m in. Who wouldn’t want a brownie for breakfast? The pictures alone are making my mouth water so I’m off to the kitchen. This looks amazing! I have to find a vegan friendly treat to bring into my office meeting that everyone will love, I’m thinking this with some strawberries and maybe some other fruit might be really great! I’m going to try it out since I have everything on hand at home! Hoooly man I need this in my life. PRONTO. 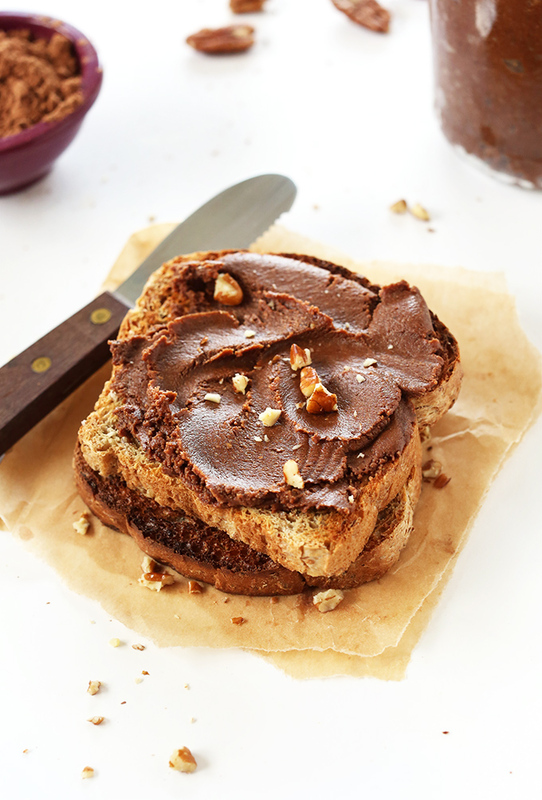 I’ve never actually made my own nut butter before – I don’t have a food processor! To top that off I’ve never eaten a date. I don’t even know where to get them in the store! I think I’m going to get a Vitamix so I can just have a blender AND processor. And finally make my own nut butter! Just an FYI you can find dates by the raisins in the grocery store :) Some specialty stores or markets may also have them in bulk or in plastic containers separately! Thanks for the tip, Zach! Yes! Just leave the dates out and add a little more cocoa or cacao powder to help thicken – it won’t be as “batter-ish” but still delicious! Oh my goodness… I cannot wait to try this! Another great recipe Dana. Yeah, maybe cut it in half! Even though I used a Vitamix, mine never quite turned to butter. Maybe it’s because I left the dates in the blender before adding the nuts. (Or maybe an impatient 14 month old didn’t want to allow me sufficient blending time.) Anyway, I decided to roll it into balls and chill them to make brownie bites. Delicious! Yeah, the dates make it firm up, which is why I suggest removing it then adding it back in a *little* at a time until it forms a spread. Glad you still enjoyed it! I actually rolled some of mine into a ball today and enjoyed it as a little truffle. So good! This is definitely one of those recipes where all of these ingredients are just on hand already!! So fun! what’s the shelflife on this? Well, I made it a couple weeks ago and it’s just fine. I’d say the sooner you eat it the fresher it will taste, and until it smells or tastes off, it’s fine! At a guess, I’d say 3 weeks. Oh.my.goodness. This looks amazing! 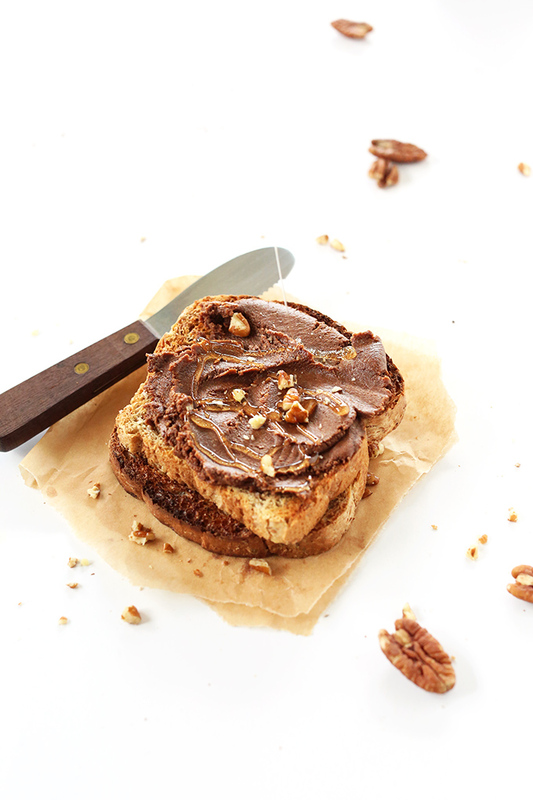 I’ve made your almond joy butter a few times and absolutely love it. This stuff though, has the potential of becoming a new obsession. Oh yum, I can’t wait to make this! Love this! And just checked out the almond joy butter which looks beyond awesome Dana! Funny, I *just* used the same exact ingredients in different ratios to make brownie fudge Larabars, so I’m sure this is absolutely fantastic! What food processor do you use? 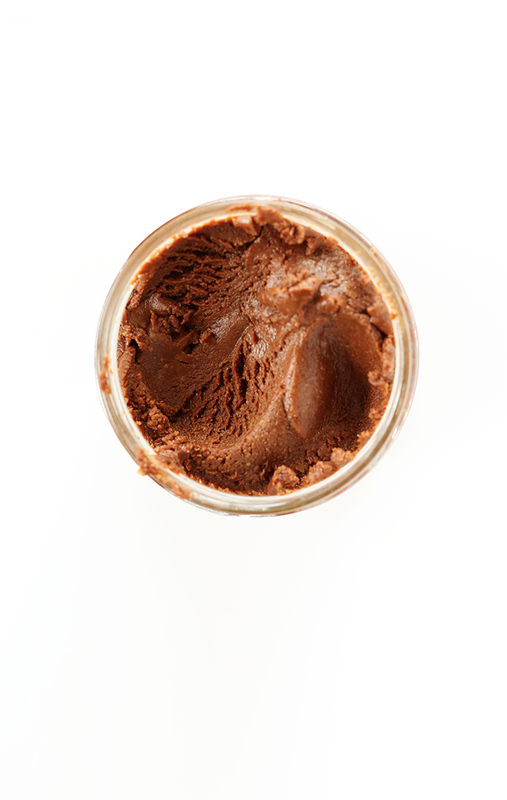 Mine is such a drag when it comes to nut butters, sometimes it works, sometimes it doesn’t.